Orange has kicked off 2017 with a solid (albeit not mind blowing) first quarter, reporting 0.6% year-on-year growth, but is starting to show some real momentum in the convergence arena. The convergence strategy would appear to be bearing fruit with 259,000 net sales across the period representing a 11.2% year-on-year boost and taking the total number of customers up to 9.5 million. The team has not had it all their own way however, as revenues in its French domestic market declined by 0.1%, while the Africa business dropped 2.5%. There was enough positive work across Europe to make up the loss, especially in Spain which saw an 8.5% gain. “The first quarter confirms the improvement in the 2016 trend. Revenues are growing, driven by solid commercial performances, particularly in France, Spain and Poland,” said Stéphane Richard, CEO of the Orange Group. On the broadband side of things, fibre is continuing to make its mark on the business as investments increased 7% sequentially. 21.5 million households now have fibre connectivity across the Group’s footprint, 10 million of which were in Spain and 7.4 million in France. The fibre investments does seem to be paying off, as the quarter saw 200,000 net sales, taking the total fixed broadband customer base up to 19 million, with 3.7 million fibre customers, 64% up on Q1 2016. 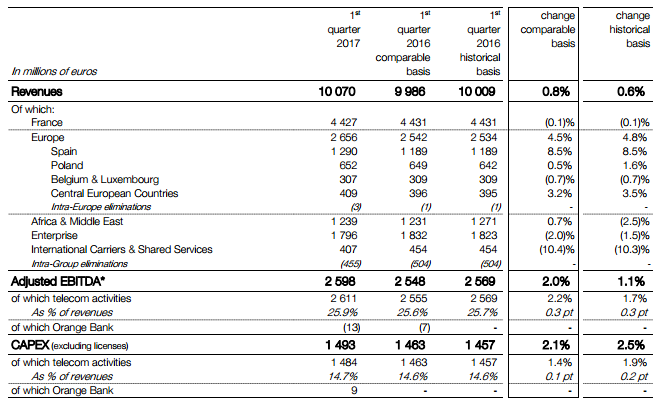 Mobile contract net sales stood at 298,000, demonstrating a 4.1% year-on-year gain, with 4G contracts up 48% to 29.5 million customers, now accounting for 58.4% of the contract base in Europe. The convergence strategy does seem to be paying off for the business, but perhaps the most interesting story over the next couple of months will be the success of Orange Bank. The launch of the bank was only announced last week, though Q2 should offer some insight into the traction as the product will be launched for employees next month, and the general public in July. Diversification does seem to be a hot topic in the telco world currently, though Orange seem to have timed it well. Other telcos might be diversifying to make up for lost revenues in the core business, though Orange does seem to have sorted out the cash-cow, generating some solid momentum behind the new, and potentially risky, avenue.